Cinque Terre is made up of five towns: Monterosso, Vernazza, Corniglia, Manarola, and Riomaggiore, all of which are absolutely gorgeous in their own unique ways. Some, of course, are more touristy than others, but all are worth visiting while you're there! Here's a quick lowdown on each of the villages. Monterosso is northernmost village of Cinque Terre, and easily the most tourist-filled, but it's not hard to understand why: it has the best beaches. It also has good food and shopping, but definitely watch out for tourist traps the closer you are to the beach. 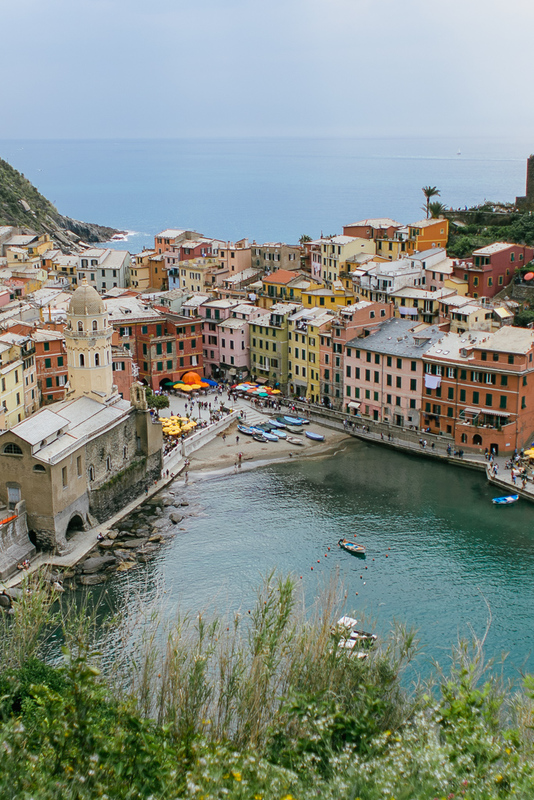 Moving south, Vernazza is easily one of the most photographed villages, particularly from the hiking trail. It has a port/harbor that extends around its cove and plenty of shops and restaurants, and you can swim in the cove from the small sandy area. Just watch out for small boats coming in and out of the harbor. Next, Corniglia is probably the smallest and quaintest of the five towns, and it's actually the one I stayed in! It's high up on the hill and has some spectacular views of the sea as well as Manarola to the south. Corniglia doesn't have a proper beach, but it does have water access if you're willing to walk down hundreds of steps. I did it twice, both times at sunset, and it was totally worth it. Access isn't clearly indicated, so hardly anyone is ever down there. If you're trying to find it, just look for stairs going down from the square, and you will eventually find the long zig-zag staircase that leads to the water. Manarola is the next village down, and like Corniglia, much of it sits on a hill. Again, there isn't a proper beach, but you are still able to swim off the rocks in a deep swimming hole. I didn't spend much time in Manarola, so that's about all I've got for you there. Last is Riomaggiore, which is also frequently photographed. Most of the town sits at an incline, but there are some really cool spots you can make your way to for a beautiful view. You can climb around rocks that protrude from the sea to have a picnic, snap some photos, or enjoy the sunset. There is also a small pebbled beach to the south of the town, which can be reached by walking down the stairs that lead from the harbor. First you have to decide which town to stay in, which may or may not matter that much to you. If you really want to be near the beach, I would recommend staying in Monterosso. But at the same time, every town is just a train ride or hike away. You will also want to look at prices in each town, as that may sway you toward or away from any particular place. From there, you can look into hotels, AirBnb's, or hostels, depending on your budget and preference. I personally chose to stay in a hostel for two reasons: first, because I am on a tight budget and hostels are notoriously cheaper than hotels and b&b's, and second, staying in a hostel provides a great environment for meeting other travelers, whether or not one is a solo-traveler like myself. I stayed at the Ostello Corniglia, where I had a great experience. I met other travelers both from the states and around the world, and the location was perfect for what I needed, especially considering I hardly spent any time there. I mean, why would you choose to be inside when outside is so, so gorgeous?! And truthfully, you really can't go wrong. Just remember that there will be a lot of steps to climb, no matter where you choose to stay, so get ready for a real good leg workout. Thankfully it's super easy to see all five towns of Cinque Terre, whether you choose to hike between them or take the local train. 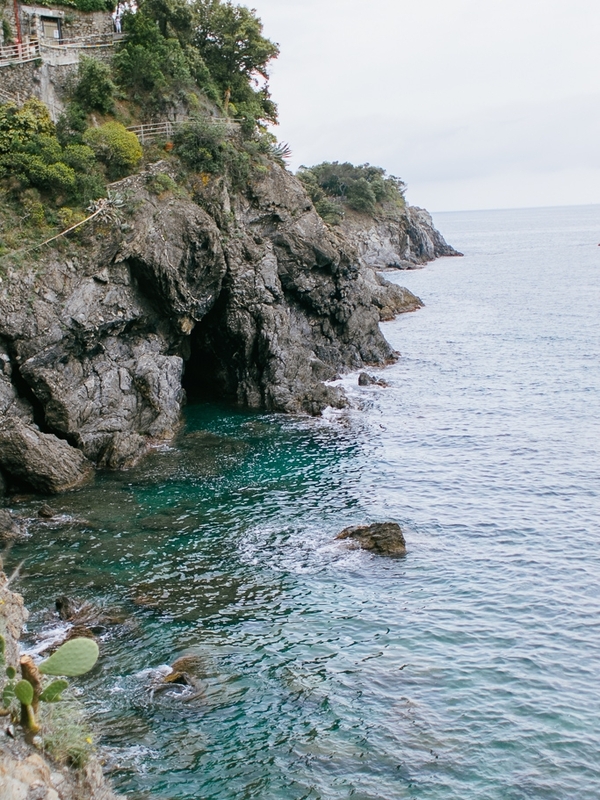 First things first, you have to get to Cinque Terre. The easiest way is to take a train to either Levanto from the north or La Spezia from the south (about a 2.5 hour jouney from Florence, 1 hour from Genova, 4 hours from Rome). I think that the best and easiest way to search for train schedules is using Rome2Rio (online or app), which I've actually used for 95% of my transit searches for my entire trip. Once you find yourself in Levanto or La Spezia, you can do one of two things: buy an individual ticket to the town where you're staying, or purchase a Cinque Terre Card. The Cinque Terre card gives you all day (or 2 day) access to the Cinque Terre Express (the train that runs between all 5 towns), shuttle busses in each city, all open hiking paths, and public toilets. My personal recommendation would be to separately purchase a ticket to your town, and then buy the Cinque Terre Card at the beginning of your next day so that you get the most use out of it. For reference, each train ride costs about €4, hiking paths cost €7.5, and a shuttle bus ride costs around €2, whereas the Cinque Terre Card costs €16 for one day or €29 for two days. Do the math to see what makes the most sense for your trip. Access to the hiking trails costs €7.5 per day (or "free" with the Cinque Terre card). Each hike can take anywhere from 30 minutes - 2 hours, depending on the route and available trail. There are many ascents and descents on each trail, so wear comfortable closed-toed shoes. Bring plenty of water. Trust me. As of April 2018, the proper trails between Riomaggiore and Manarola as well as Manarola and Corniglia as closed for landslide issues. There is another trail between Manarola and Corniglia that you can take, but it literally goes al the way up the mountain and back down, and clocks around 2.5 hours. You've been warned. I personally hiked the trail from Vernazza to Monterosso (in a dress and converse, lol at my life) and it took me about 1.5 hours. It was beautiful and absolutely worth it, but it definitely wasn't a walk in a park. If you're super active, however, you may find the trails easy-peasy (and I salute you). Like I mentioned above, hiking is a big deal in Cinque Terre. Some people even go there just to hike from top to bottom (or bottom to top, those crazy kids)! And I get it. It's beautiful terrain withs stunning views in a fairly moderate climate, so wouldn't want to hike some — or all — of Cinque Terre? 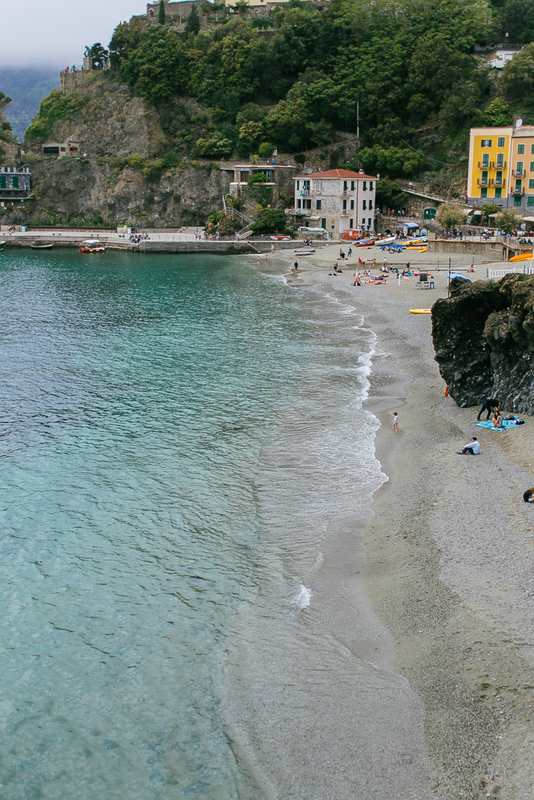 It's also a great place to enjoy the ocean and/or get a good tan, so if you want to lay out on the beach with a book or bottle of wine, be sure to hang out at one of Monterosso's two beaches. There is public access at both beaches if you want to bring a towel, or you can posh it up and rent a lounge chair and umbrella for the day. I chose the latter, and for €10 I sunbathed, swam, and read for over 6 hours, and it was worth every penny. Il Pirata (Vernazza) — this spot was recommended to me by a friend, and I liked it so much I went two days in a row. While they have dinner options in the evening, I stopped by for breakfast/brunch, where I got cappuccinos as big as my face, a ricotta croissant, a pear tart, and a chocolate croissant wrap. All SO good. Cafe Matteo (Corniglia) — not the most eye catching spot from the outside, but holy moly was their pizza delicious! I ordered a margherita pizza with pesto for takeaway, and ate the whole dang thing while watching the sunset down at the water. Bar Terza Terra (Corniglia) — this place boasts an amazing terrace view of the sea, and it was here that I got an aperol spritz and bruschetta on my first afternoon in Cinque Terre. I returned on my last morning for an apple tart and cappuccino before catching the train. L'Ancora del Tortuga (Monterosso) — this place was a little pricier than I would typically spend, but I was real hungry after that hike and just wanted to enjoy a view. I wasn't disappointed with my order though... not at all. I got the pesto lasagne and it was so tasty. Lastly, when you find yourself in Cinque Terre, I want you to remember to slow down and enjoy everything that it has to offer. From its breathtakingly beautiful views, to the sparkling clear blue water, to the Italian kindness that drips from each little village, I hope that you learn more about yourself and the world at large while spending time in this beautiful part of Italy. Oh, and gelato. Eat all the gelato. Ciao!